You don’t need to look like the other Powersports dealers in your area. 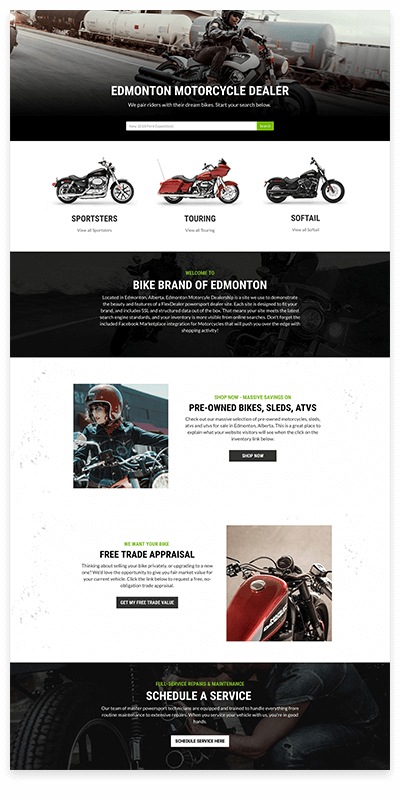 Your impressive Powersports dealer website is custom designed to help your brand stand out in your market. The right content helps build relationships of trust and shape purchase decisions. Excite and engage your customers with website content that is designed to create repeat and referral business. We inject Schema.org and advanced structured data into each vehicle listing out of the box so that your inventory is categorized correctly and highly visible within Google search results. As part of your website bundle, we include pushing your inventory through to Facebook Marketplace. Meet ATV shoppers where they’re looking: on the marketplace. Behaviour-based targeting allows you to show live inventory to in-market shoppers on Facebook. With timely ads, you can promote the same vehicles they were looking at on your site. Get real-time insights about the people shopping on your website with our lead-monitoring dashboard. Discover the referral source, page, keyword, or ad that are generating phone calls and web forms. Our tactical approach to Local SEO helps your dealership rank higher in search results. We audit and fix elements of your digital presence that are getting in the way. Technology in our industry is quadruple the price than any other. FlexDealer is on a mission to bring innovation to powersport dealers without breaking the bank.